What is a Donkey Ball you may ask? 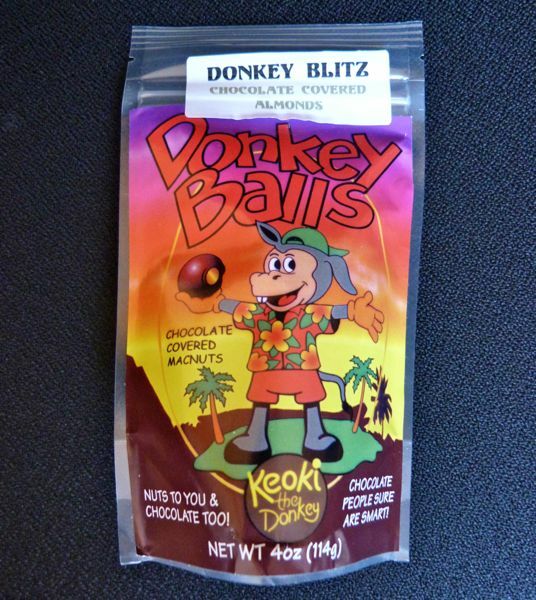 Donkey Balls (made and sold in Hawaii) are generally large and round chocolate spheres with whole macadamia nuts residing in the centers. But, today's "Donkey Blitz"bag from the Big Island were bite-sized chocolate covered almonds. Keoki the Donkey is a cartoon character that appears on Donkey Balls chocolate mac nut packaging. He seems to be the source of two quotes that appear below him: "Nuts to you and chocolate too" and "Chocolate people sure are smart." Yes, Keoki, they certainly are. Smart enough to know that chocolate and almonds are a winning combination. Today was Day #2 of Chocolate and Almond Theme Week.